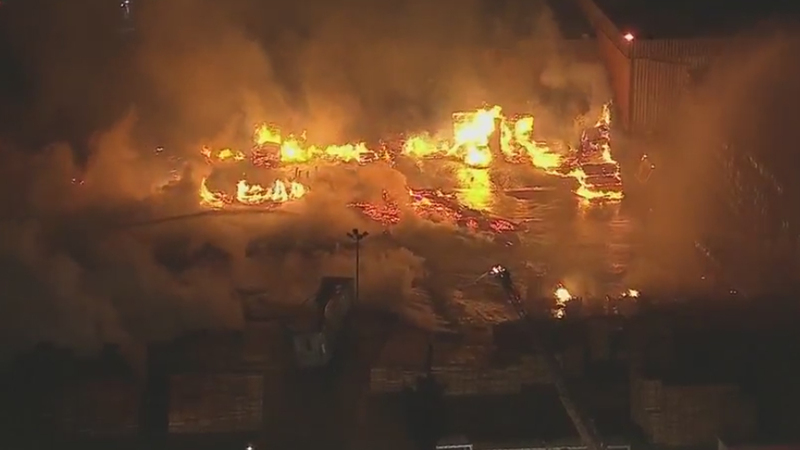 SAN BERNARDINO, Calif. -- Firefighters knocked down a massive fire at a pallet yard in San Bernardino Friday morning.. The dramatic blaze was burning in the 1200 block of Mountain View Avenue, the San Bernardino County Fire Department said on Twitter at 4:22 a.m. At least 19 fire engines were on scene, along with a bulldozer and a hand crew, the agency said. SAN BERNARDINO: #SBCoFD on scene COMMERCIAL STRUCTURE FIRE pallet yard w/ exposures. 1200 blk. S. Mountain View. 3rd alarm requested.